So, just how many “2nd attempt” notices does one receive? And, of course, there are the endless “Final Notice” mailers…ah, if only they really were the FINAL notices we’d receive. But, alas, these purveyors of bogus extended warranty policies are a tenacious bunch, determined to wear us down or scare us into purchasing their essentially worthless policies. Let’s face it, extended warranties on vehicles, in general, whether via your dealer or an insurance company, are a waste of money. The deductibles are ridiculous, leaving you to pay the lion’s share of repairs, or you’re told that your particular policy doesn’t cover the particular repair you need (of course, when you purchase your car, they conveniently leave out that tiny bit of minutiae). This is what I plan to do the next time I purchase a new vehicle: I’m going to put money into a “car repair fund” account each month so that when my manufacturer’s warranty expires, I’ll have a nice cache of money to use for repairs. No applications, no waiting for approvals that never come. Just get the damn repair done. So, what lands in my mail box AGAIN? Yep, another notice from the same company that sent me a “FINAL” notice back in April of 2013 . I suspect that they’re all one company, operating with several different monikers, but all originating out of Illinois and Missouri. This time around it’s Guardian’s turn…again, supposedly now located at 11 Executive Drive, Fairview Heights, IL 62208. A screen grab of Google Maps shows that, as of June/2013, Unisys occupied the building at that address. 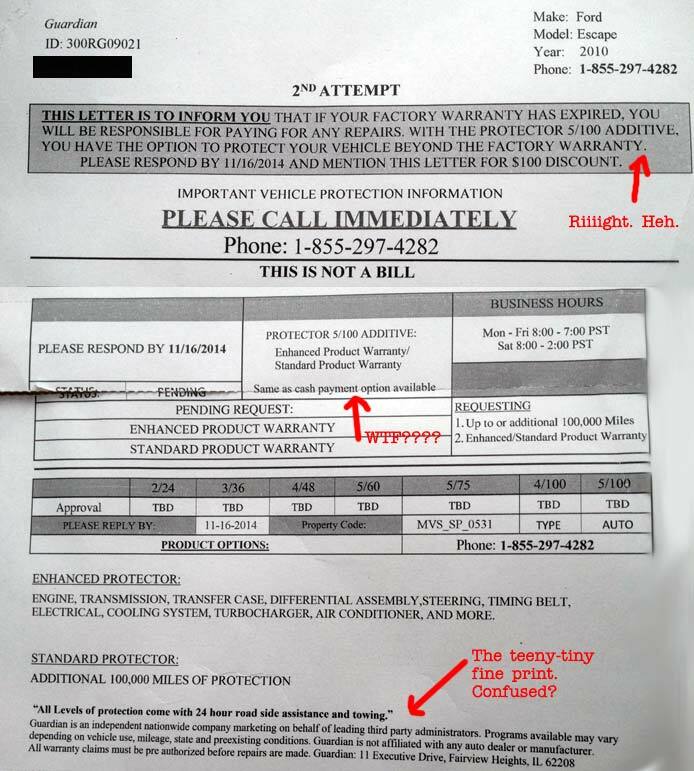 However, there’s a company called American Guardian Warranty Services which comes up when searching for the phone number listed on this particular mailer, 855-297-4282, and they are allegedly located at 800 Roosevelt Road, Suite E300, Glen Ellyn, IL 60137. Yelp reviews reveal a whole lot of pissed off people, either because they got the runaround after attempting to use their warranty (no surprise there), or because they keep receiving these annoying mailers. So, basically, Guardian is acting as an insurance agency, supposedly matching you up with policies from various warranty vendors. Kinda like a box of chocolates: you never know which one you’re gonna get. And chances are, you’ll end up with something maggoty and nasty that you’d have to toss in the garbage. Whenever you receive these worthless, bogus mailers, just pitch them in the paper recycle bin with nary a worry. 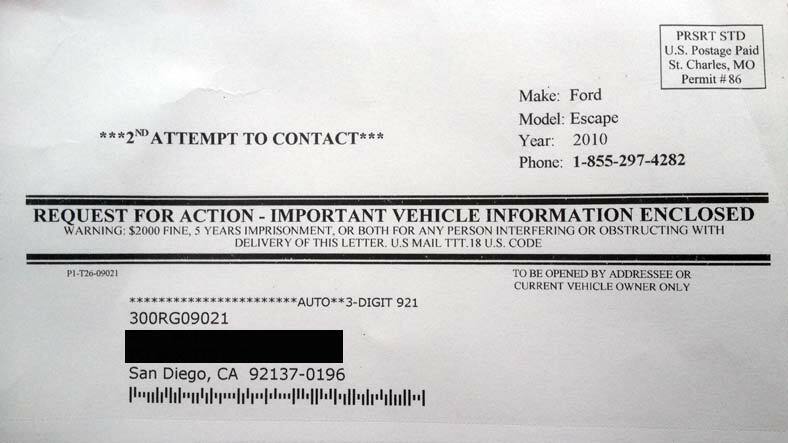 Unfortunately, however, these companies are at liberty to obtain your vehicle registration information from state DMVs whenever they like, so you can assume you’ll receive more of these mailers over time. Also, if you ever receive a phone call from one of these companies, just hang up on them without engaging in conversation, even to tell them to stop calling you (they won’t). They’re trained to keep you on the phone to wear you down, even though they’re paid minimum wage (perhaps with a tiny commission dangling over their cubicles like a carrot). Once again, I must remind you: caveat emptor.